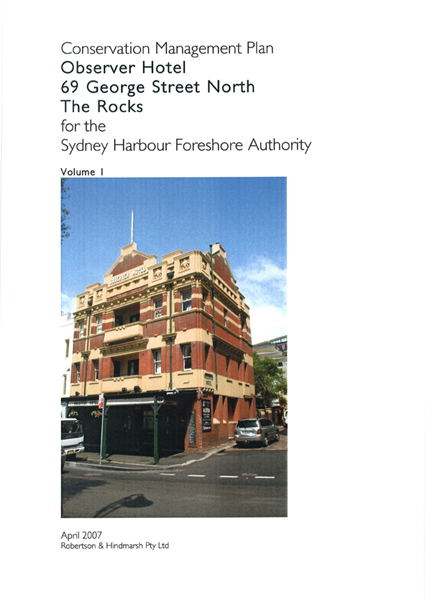 Robertson & Hindmarsh Pty Ltd were commissioned in 2007 by the Sydney Harbour Foreshore Authority to update a previous conservation management plan on the building. The report authors were Noni Boyd and Scott Robertson. 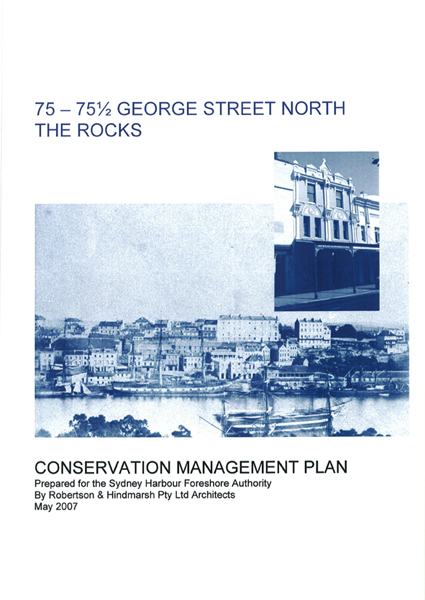 Robertson & Hindmarsh Pty Ltd were commissioned in 2003 by the Sydney Harbour Federation Trust to prepare a conservation management plan for the Cockatoo Island Dockyard former Design Office (Building 10). The report authors were Terry Kass, Tony Lowe and Scott Robertson. 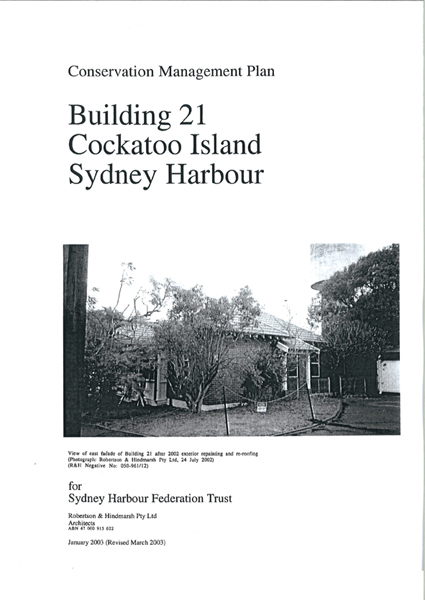 Robertson & Hindmarsh Pty Ltd were commissioned in 2003 by the Sydney Harbour Federation Trust to prepare a conservation management plan for one of the former residences on Cockatoo Island (Building 21). 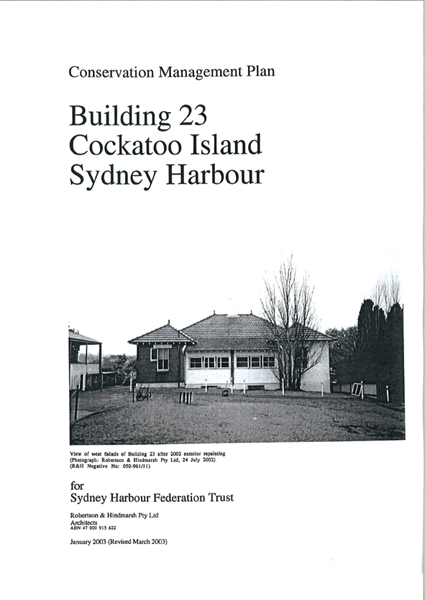 Robertson & Hindmarsh Pty Ltd were commissioned in 2003 by the Sydney Harbour Federation Trust to prepare a conservation management plan for one of the former residences on Cockatoo Island (Building 23). 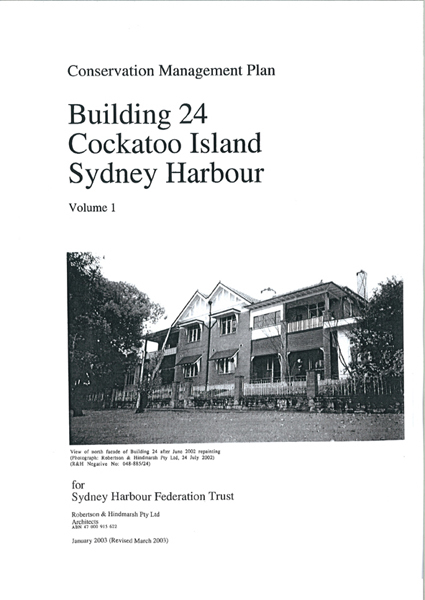 Robertson & Hindmarsh Pty Ltd were commissioned in 2003 by the Sydney Harbour Federation Trust to prepare a conservation management plan for one of the former residences on Cockatoo Island (Building 24). 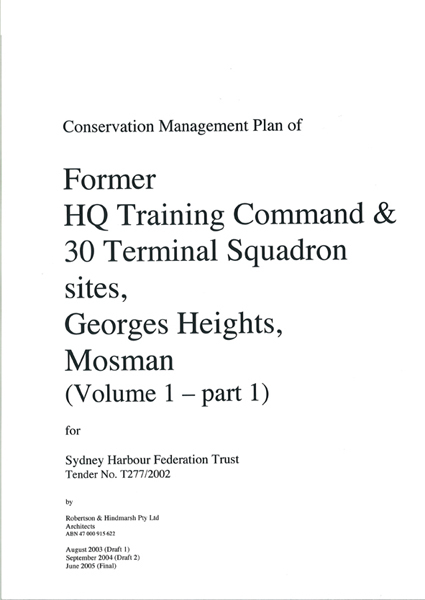 Robertson & Hindmarsh Pty Ltd were commissioned in 2003 by the Sydney Harbour Federation Trust to prepare a conservation management plan for the former Headquarters Training Command and 30 Terminal Squadron sites at Georges Heights in Mosman. The report authors were Noni Boyd, Trevor Howse, Terry Kass, Tony Lowe and Scott Robertson. 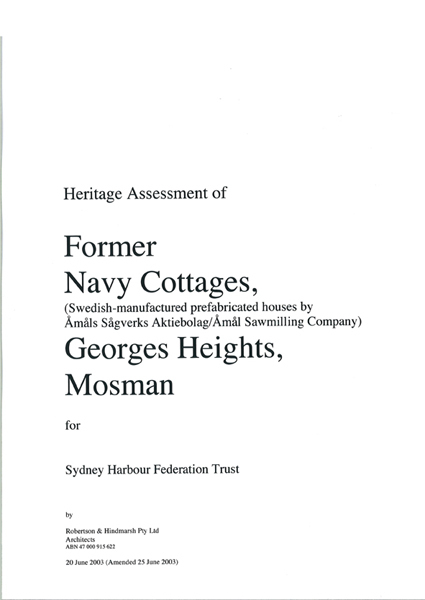 Robertson & Hindmarsh Pty Ltd were commissioned in 2003 by the Sydney Harbour Federation Trust to prepare a conservation management plan for the small complex of Former Naval Cottages in Middle Head Road, Georges Heights. The cottages wereprefabricated timber buildings made in Sweden by Amals Sagverks Aktiebolag and imported into Australia after World War 2. The report authors were Noni Boyd, Terry Kass and Scott Robertson. Scott Robertson wrote the chapter, "Everyman's Castle: Housing in NSW 1918-1942". In 2002 the book was the winner of the EnergyAustralia National Trust Heritage Award in the print category for community groups. 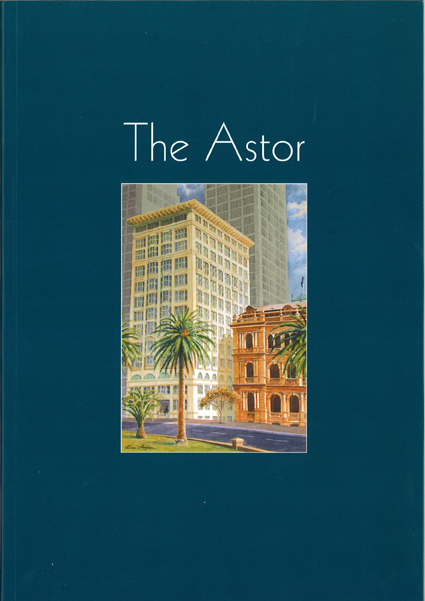 Scott Robertson wrote the chapter, "The Architecture of the Astor". 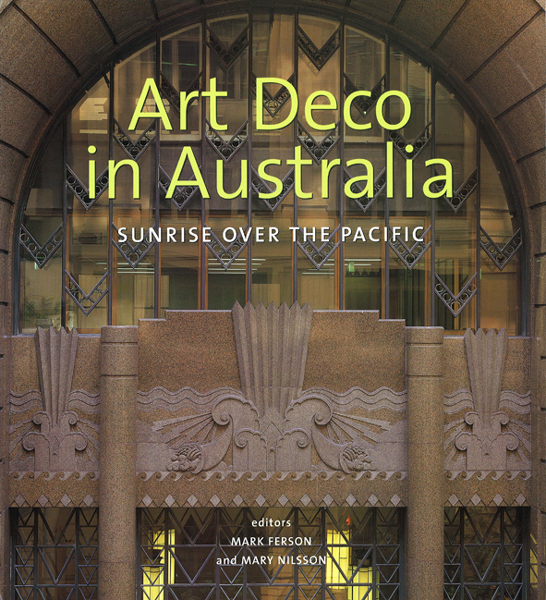 In 2004 the book was the winner of the EnergyAustralia National Trust Heritage Award in the print category. Robertson & Hindmarsh Pty Ltd were successful in obtaining a grant from the NSW Heritage Office to cover part of the costs involved in researching and writing a landmark study of the sites in NSW which were used in the two world wars. 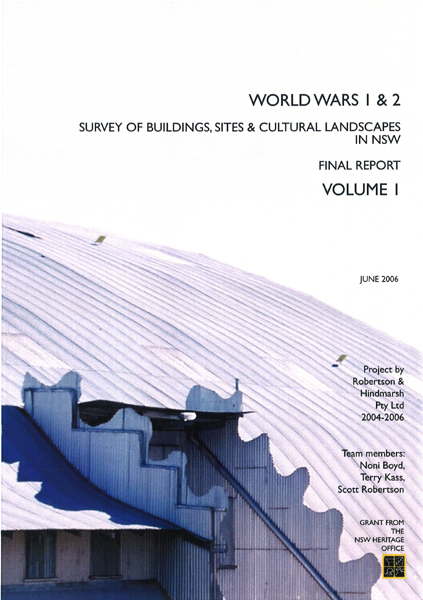 In 2007 the report was the winner of the EnergyAustralia National Trust Heritage Award in the Interpretation and Presentation - Individuals category.